Force is a push or a pull that can cause an object to start moving, stop, or change speed or direction. 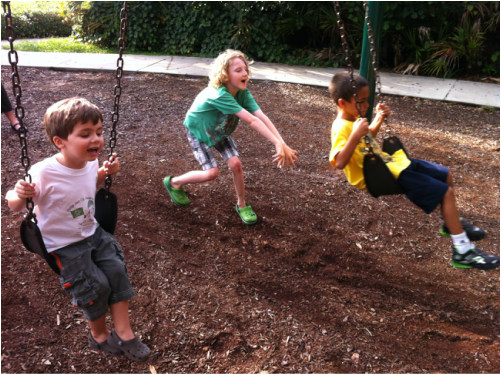 When you push a friend on a swing, you are using force. The harder you push, the further your friend will go! Object move fast or slow on different surfaces. This is because of friction. Friction is a resistance to motion on a surface. If you kick a ball on grass, the ball eventually slows down because of the bumps in the grass. What would happen if you kicked the ball on a smooth surface such as a basketball court? The ball will roll farther because there is less friction on the surface of the court. The same goes if you try to slide with your sneakers across pavement. Do you think you will slide? No, because there is too much friction between your shoes and the pavement. If you try to slide with your same sneakers across ice, you will slide since ice is a smoother surface with less friction. As we saw in the video above, objects that are moving tend to stay moving. Objects that are still tend to stay still. Have you ever heard of the tablecloth trick? Watch the video below to see it! Kids, don't try this at home! This is a classic experiment when we are learning about force and motion. The heavier the objects are, the easier it is to pull the tablecloth out. Why do you think that is? The more mass there is, the harder it is to move. Since the glasses filled with water have more mass, it is harder to move them, and therefore easier to slide the tablecloth out from underneath. The experiment was harder with only the plates since the plates are easier to move because they have less mass.